Earlier that week I saw another request. This time the parent had already wasted $30 on a non-functional, cheap microscope for her kids. I'm looking for recommendations for a microscope. I bought a $30 one from Amazon that had great reviews. I spent half an hour trying to get the thing to focus, but never could because the lens kept moving every time you barely even touched it. Also, there was dirt and a hair in the lens itself that I couldn't get out. I could quote parents all day long. Instead, our team spent several weeks creating and compiling this guide. This kids microscope guide will help you pick right the first time and save you time, hassle, and money. Microscopes can be the perfect gift for a child who loves science. Some models will be a little pricey, but if you are looking for a unique gift idea you’ve found a match! Instead of purchasing another toy, another game, or another book, this present is the key to an otherwise unreachable micro world. Curious children can spend hours collecting materials for new slides and then observing. Microscopes are also an essential tool for learning about biology and supplementing boring textbook material. We all prefer hands-on learning to a boring textbook, and the ability to zoom in on microbiology truly encourages a child’s curiosity and passion. Yes, there are plenty of online labs and YouTube videos of microbiology. But they simply can’t take the place of experiential learning. No virtual lab will let you observe the microorganisms from the water you collected from your backyard stream. No virtual lab has the “unknown” factor that accompanies trial and error testing. When you look at quality, functionality, and price, this model can’t be beaten. If you spend several thousand dollars, you’re still unlikely to notice any difference in capability. This is the best value for the money. Younger children will be able to “grow into” the microscope, because it will remain a useful tool for many years to come. The device is appropriate for a plethora of scenarios: early education, educational lab environments, teaching demonstration, medical labs, and veterinary clinics. Everyone from eight-year-olds to college microbiology students will discover this microscope suits their needs. One of the coolest features of this microscope is the ability to connect a USB digital camera to the lens and record the cellular activity. The video/photos can then be saved to a computer. What can I see? Eight levels of magnification range from 40X-2000X allows students to see the nucleus, cell walls, cell membranes, and some of the bigger organelles. The package comes with everything you need. 100-piece blank glass slides and cover slips and plenty of lens cleaning paper. If your child is too much younger than 10 years old, you will want to supervise. This is a complex machine, and you may want to consider a different model. Maybe the OMAX compound microscope above is a bit too pricey. Or maybe you want a bundle that includes everything you could possibly need to get started, beyond blank slides. You’re in luck because there is a great alternative, and this one is specifically designed for students. Some of our homeschooling staff have used this microscope with their kids. It was award best student microscope set in 2016, and there is an excellent Osborne book bundled in the set. The packaged set includes everything you need to start for a single, affordable price. Think of this model as a downgraded version of the OMAX. There are fewer levels of magnification, five that range from 40X-1000X. And, you can’t hook it into your USB port and view the cells on your computer. However, the package includes additional accessories the OMAX bundle doesn’t contain: The World of the Microscope (book), Tweezers, Swab, ID stickers, a vial, 5pc Specimen Slide Kit, pre-made slides, and more. Biggest problem: The stage is not mechanical. In non-technical terms, this means you cannot move the slide once it has been mounted. The adjustment must be made manually. And, unlike other AmScope models, it was not designed to fit a mechanical stage. So, purchasing one separately isn’t an option. For some people, this is a deal breaker, and I’ll admit – it can be a huge pain. The best alternative if you need an adjustable slide stage is the AmScope M150. Once again, this is a model that will impress even a college professor. Unlike the previous student microscope, this isn’t a set, so it does not include hundreds of accessories. However, in contrast to the AmScope M162, you can purchase and attach a mechanical stage. Click here to see available mechanical stages. You’ll also need to spend some additional cash if you want more accessories (pre-made slides, vials, etc.). I got one of these for my son when he first asked for a microscope, and it's been a huge hit. I love that it's so cheap I don't have to worry about it getting broken. Plus, it comes with a lifetime warranty. My son carries it all over with him. It was not designed to use slides, but it was a great starting point for our son. It works surprisingly well, don’t dismiss it because of the price or size! When we did a butterfly unit, after the butterflies emerged, we kept their cocoons, and my son looked at them using this microscope. He could see all the little strands that made the cocoon. It is harder to keep a slide stable because there's no clips or anything to hold it in place. So, just what can you expect to see? The magnification is 60x-120x. You’ll be able to observe the hairs on the leg of a fly, dust mites, trichomes, and so much more. The model only takes 1 battery which is awesome, and the light is surprisingly powerful. The biggest pros of a pocket microscope are that it usually gets more use than a table top one. Do you have a young backyard explorer? He or she can carry this everywhere they go. Seriously, buy this in combination with a table-top microscope. Naturally, the pocket scope will have limited capabilities, but this tool opens an entirely new way of exploring the world. Have a six or seven-year-old who wants a “real” microscope that doesn’t feel like a toy? The specifications of this kit aren’t going to wow a college student, but it provides everything you could want, all in a handy traveling case. The set includes prepped slides that allow young students to learn how to use a microscope (focusing, adjusting, etc.). The materials are durable, and three levels of magnification (300x, 600x, and 1200x) go a long way. As a bonus feature, kids will enjoy the built-in color filter wheel. Your young scientist will feel extremely sophisticated with the 50+ pieces. Colorful, fun, safe, and functional, the GeoSafari Jr. My First Microscope is the #1 recommendation for a “toyish” microscope. The microscope’s design is perfect for kindergartners and preschoolers. The eyepieces are wide and comfortable, the nobs are large and easy to grasp, the frame is robust and durable, and the 2.5-8X magnification is sufficient for viewing large items. When we talk about microscopes, we are referring to optical microscopes, often known as light microscopes. These are the most common type of microscope and they’ve been around for quite some time. There are three basic types of optical microscopes: simple, stereo, and compound. A simple microscope magnifies through a single convex lens and is essentially a glorified magnifying glass or eyepiece. More useful, the stereo microscope allows the young scientist to perceive a three-dimensional visualization of the sample. Don’t expect to see cellular activity. A stereo microscope is best for large samples and dissections. “But I want to see cells!” For this reason, the best type of microscope for a serious young scientist is a compound microscope. These tools allow scientists to observe things at the cellular level. These microscopes always use slides and should have a light source that shines from below the slide. The biggest differences: magnification and design. Most kids toy microscopes and stereomicroscopes will zoom in around 8-100-300x. The end range may sound like a lot, at first. Until you see that compound microscopes offer 1,000-2,000x+ magnification with high resolution. What Is a Toy Microscope? A children’s toy microscope is much closer to being a glorified magnifying glass. Stereo microscopes intended for kids (4-8 years old) will be visually designed to look like fun toys. Not all stereo microscopes are meant for kids, plenty of professionals use them. However, you will be unlikely to find many powerful compound microscopes designed with bright colors and rubber edges. What Type of Microscope Should I Buy? Without making things more complicated than they need to be, you’ll want to consider your child’s age, capability’s, and maturity. If the microscope is for your homeschool curriculum, you should consult your curriculum provider. The best microscope for kids depends on the age and maturity of your child. And before you spend too much money, it’s also worth considering the likelihood of the child using the microscope on his/her own time. Eight-year-olds may use a cheap stereo microscope every single day for observing household objects. On the other hand, a far more expensive compound microscope may collect dust when given to a disinterested teenager. Without parent supervision, a compound microscope is probably inappropriate. These machines are not simple to operate, and with real glass slides and covers, they can potentially even be dangerous. Nevertheless, plenty of children under ten can use and enjoy a complex microscope. Just keep in mind that a toy microscope or a stereo microscope is a much more appropriate choice. The younger your child is, the less likely he/she is to be curious about microbiology. Instead, a kid’s microscope that is designed for magnifying larger objects, like bugs, flowers, leaves, food, and other household items, will be more likely to capture their interest and attention. A compound microscope will likely receive a lot more use around middle school ages. And it can be very exciting for kids to transition from a toy to an “adult” lens. Around this age, children are mature enough to collect samples and prepare their own glass slides. Their observations can then be used for a class, a science fair project, or just for fun! Microscopes are expensive to fix. In many cases, it could be a good idea to start your child with a kid’s ‘toy’ microscope. This way you can teach him/her how to care for the lenses and slide, and the rules of using it before investing in an “actual” microscope. Apologia Biology recommends a $180 microscope and $89 for the slides. For homeschoolers on a budget, this may be too expensive. I have a microscope but it doesn’t have a fine focus knob which the Apologia text says is necessary for their slides. Has anyone used them with a simpler microscope? 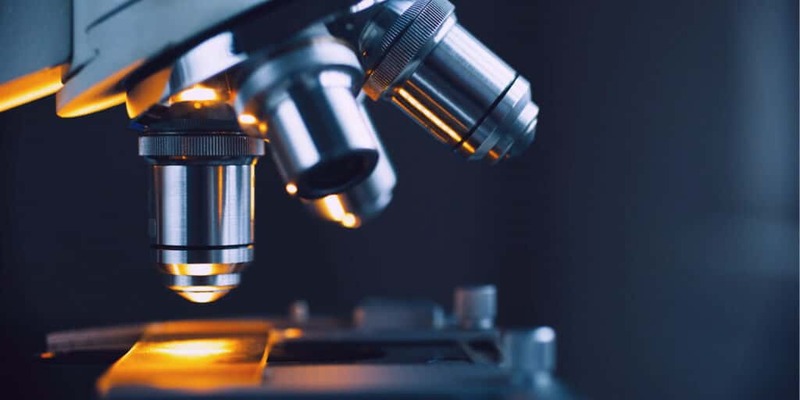 Microscope skills, including actually adjusting a microscope, are valuable if your student is interested in pursuing life sciences in college. Maybe you could find an extracurricular where these skills could be developed? Whenever you purchase second hand, it’s even more important to purchase a quality model. While a cheap plastic tool may last for a year after opening the box, this may use up the product’s entire lifespan. If you can’t afford to buy a new microscope, certainly do not waste your money on a cheap model being sold used. Look for school microscopes and full metal body microscopes. You can find some very, very excellent school microscopes on Craigslist for a steal. There’s no guarantee you’ll find anything, but if you’re looking for a bargain, it is undoubtedly your best hope. Another option would be to check with a local college to see if they are getting rid of any as they usually offer them for a very good price. Does more magnification mean a better microscope? Not necessarily. Think about a photo on your iPhone. You can continue to zoom in, but the quality decreases. After a point, you’re just looking at one giant blur with some color. If a lens does not continue to increase detail, resolution, and quality while providing magnification, you’re not going to see much. Your microscope needs to produce a high quality resolution. 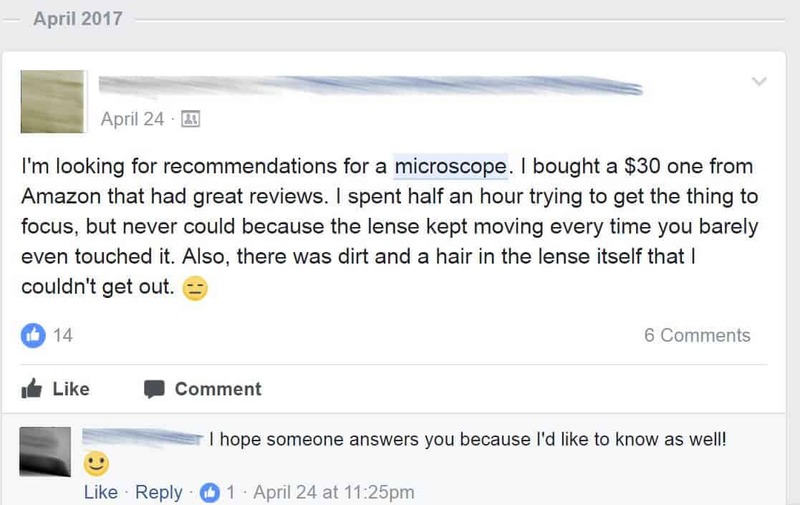 For students, I would not recommend purchasing (or even regularly using) a microscope that doesn’t have a fine focus. A fine focus knob allows you to change depth of vision within a specimen. Therefore, if you don’t have it, you might not be able to see every cellular structure perfectly clearly. To ensure you purchase the highest quality microscope, you always want to find a model with an all-metal frame and as few plastic parts as possible. Never settle for plastic, no matter how ‘durable’ the manufacturer claims it will be. The more adjustable pieces, the easier it is to focus on the slide. Manually removing and adjusting slides is incredibly annoying. I cannot afford the price point of what most microscopes cost, and I don’t exactly want a cheaply made one either. Do you have a good recommendation for one that we can grow into, but not overly expensive? With a budget of around $100, you can get an incredibly high-quality microscope. Check out the top models we already listed. If you want to grow into one, it would be best to purchase one of the AmScopes. If they are outside your budget, the portable microscope will give you the most bang for your buck. Microscopes provide nanometer resolution imaging. All life is built from microscopic origins. These tiny things build everything we see around us. Microscopes are literally a lens into this world. Ecosystems are not just based on large species. When we teach our children about nature, and we explore the woods and the rivers, we shouldn’t just be looking at the big trees and the large mammals. We should be observing the fungus and the insects crawling around. All insects have incredible biological makeups. Complex wings and mechanics that are smaller than a period on a piece of paper. You will be absolutely shocked by what you discover if you regularly use a microscope – if you make it a habit of collecting something every day to observe. It is an immense opportunity to come to this world and observe even the smallest living creatures. We are all curious about the world. We are born with curiosity, and we need to cultivate this. Curiosity needs to be nurtured and kept alive. Besides a great telescope, I can’t think of a better tool for developing curiosity than a microscope.